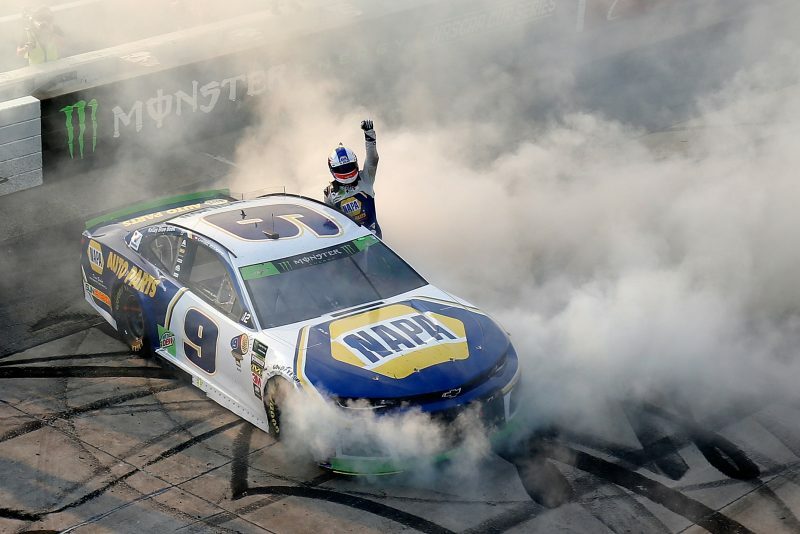 Chase Elliott has taken a second career Monster Energy NASCAR Cup Series race win after beating Denny Hamlin at the Dover International Speedway Playoff race. When most of the front running cars pitted on Lap 394 under Caution, the #9 Hendrick Motorsports Chevrolet opted to stay out, taking the restart in the lead. Elliott held on around the outside of Hamlin (#11 Joe Gibbs Racing Toyota), before a wreck on the back straight triggered another Caution period and ultimately a brief stoppage. Aric Almirola (#10 Stewart Haas Racing Ford) made contact with the wall on the exit of Turn 2, hitting into the side of Brad Keselowski (#2 Team Penske Ford) who was on his left, before the pair slid down the race track and collected fellow Playoff drivers Martin Truex Jnr (#78 Furniture Row Racing Toyota) and Alex Bowman (#88 Hendrick Motorsports Chevrolet). The crash pushed the race into overtime, as Elliott led the field back to the green-white-chequered finish on Lap 403. Elliott had the edge over Hamlin as they swept through the first two corners, despite having older tyres, getting clear of the #11 on the back stretch and holding on to the win in the remaining lap and a half. Joey Logano (#22 Team Penske Ford) crossed the line third ahead of Erik Jones (#20 Joe Gibbs Racing Toyota) and Kurt Busch (#41 Stewart-Haas Racing Ford). Kevin Harvick (#4 Stewart-Haas Racing Ford), winner of the first two stages, finished sixth after having to make an unexpected extra pit stop from the lead in the final 100 laps as a result of a valve stem problem on the left-rear tyre. Austin Dillon (#3 Richard Childress Racing Chevrolet) was seventh, followed by Kyle Busch (#18 Joe Gibbs Racing Toyota) who was penalised for speeding on pit road, Ricky Stenhouse Jnr (#17 Roush Fenway Racing Ford) and Daniel Suarez (#19 Joe Gibbs Racing Toyota). Clint Bowyer (#14 Stewart-Haas Racing Ford) was running in the top five in the closing stages, but was forced to pit on Lap 283 with a loose wheel, returning to the race track in 20th. He then brought out the Caution on Lap 392 when he fired into the Turn 3 outside wall, which proved a critical moment in the race. Almirola was leading after snatching it from Keselowski on Lap 349 and looked on course to take the win was one of a number of front-runners to pit under the yellows. Elliott elected to stay out, moving to the front row from third. The win guarantees him a spot in the Round of 8. Harvick holds a five point lead in the Playoff standings, with Elliott now fifth 45 points further back. Almirola, Bowyer, 12th place-finishing Kyle Larson (#42 Chip Ganassi Racing Chevrolet), and Bowman all sit in the danger zone and are at risk of not advancing to the Round of 8. Talladega Superspeedway hosts the second race of three in the Round of 12 on the weekend of October 13-14 (local time).